Blackstone Lodge is located in a spectacular private mountain neighborhood that offers the benefit of being close to both the ski area and downtown. This newly built home offers incredible views and luxury amenities throughout. This beautiful home allows you to enjoy vivid sunset views to the west while overlooking Fish Creek and up to Buffalo Pass. With a modern western feel that is fully captured in the design of this stunning 4 bedroom + loft home, Blackstone Lodge will delight any traveler. Upon entering the home you are drawn to the huge great room with vaulted ceilings and a huge fan overhead. Beneath your feet you are greeted with beautiful wood floors and you are surrounded by large windows that draw in the views from the west. After a big day in the outdoors snuggle up here in front of the large flat screen TV and cozy brick fireplace. The large professional kitchen has all the amenities and equipment for chefs of all levels. Viking appliances and gas stove, custom cabinetry and stone counters combine with the multiple windows all around to provide an inspiring location for culinary creation. In the mornings there is a Keurig Coffee Machine to ensure you start the day off on the best foot. There is also a gas grill on the porch so you can cook-out year-round. From the open kitchen and living area you have easy access to the large dining table that seats 10. Here you can enjoy your chef’s labors as you enjoy the views and fireplace in the living room. 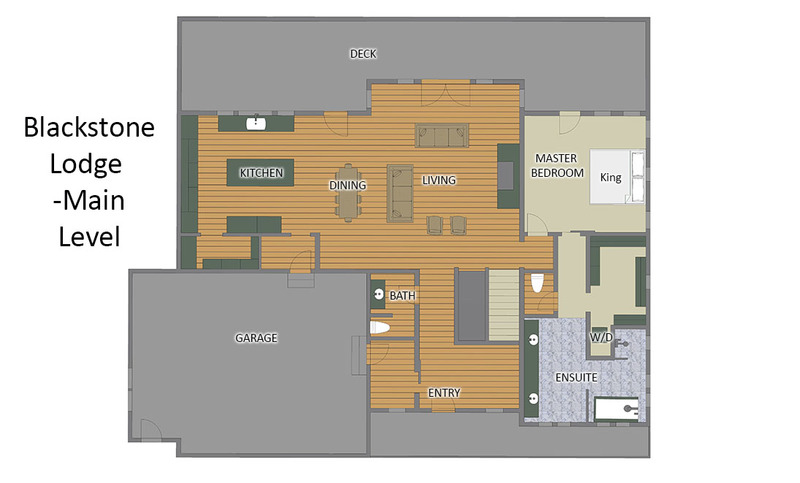 With 4 bedrooms and a loft there is room for up to 14 people. The main floor Master Bedroom has a King bed and access to the porch that allows you to enjoy the views with your morning coffee. 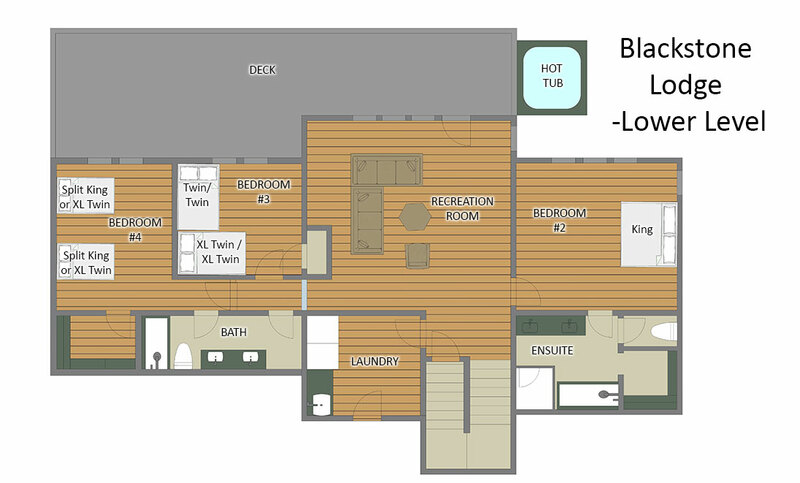 There is a large ensuite master bathroom with dual vanity, large soaking tub and separate shower. The Guest Master, downstairs, also has a King bed and large ensuite bathroom with dual vanity, soaking tub and separate shower. Downstairs you will find the Bunk Room with 2 twin bunk beds that sleep four and the fourth bedroom offers the option of either a King or two Twin beds. 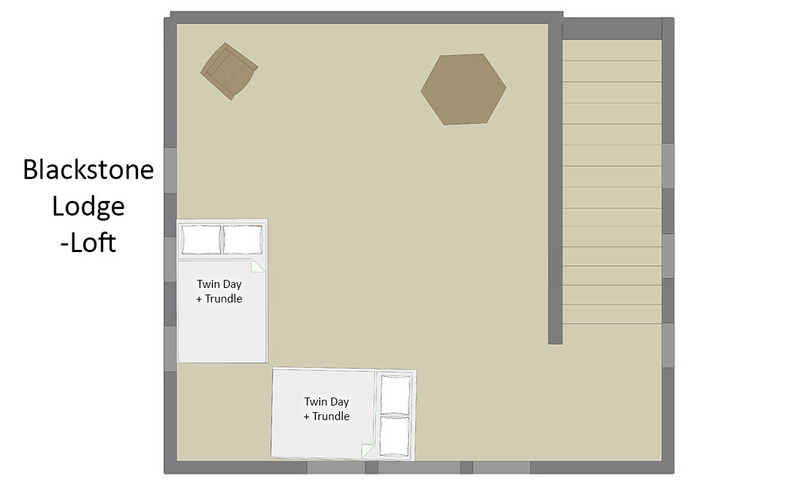 These rooms share a bathroom with a dual vanity and tub/shower combination. For extra guests, the loft has 2 day beds with trundles under them, making it a fun place to sleep 4 more. The downstairs recreation room will keep the kids, old or young, occupied with an xBox One and air hockey table. From here you also have access to the lower balcony and private hot tub to sooth those sore muscles under the stars. This home includes everything you would expect from a luxury home, including, free Wi-Fi, plush towels, and luxurious bath robes. The spacious 2 car garage offers plenty of space to store all your gear. Access to the ski mountain is easy with our private on-call ski shuttle which picks up right from your doorstep and takes only 5 minutes to reach the ski trails and mountain village, so renting a car is not necessary. Fantastic house for a guy's trip! The house was perfect for 9 guy's. Plenty of beds to go around, terrific great room to hang in after a day of skiing. The accommodations were first class. Location was convenient to the lifts, grocery shopping and to downtown. We would definitely rent the house again! A family ski vacation in Steamboat made simple with a comfortable and modern home. This was our second trip to steamboat and this Home made the vacation for us. All of the comforts of home plus some! !